This was the first coffee shop we visited. Stewart made that decision because they serve an awesome Cortado here and that’s his go-to coffee choice, the one he rates a coffee shop by. So we met up at Davis Street. There’s no question this is an incredible coffee shop. The wood interior, the artsy neighborhood it is in where you can buy a bike, get a tattoo or get some gourmet chocolates, the high end coffee making devices … it’s a sight to take in. They can roll up their front door (it’s like a big garage door) and have a great patio area out front, or you can go out back where there is literally an old school bus. I didn’t mean for the picture to make it look like a Jeep dealership but it is a really cool shop. And the coffee (that’s what is important, right?) was fabulous. 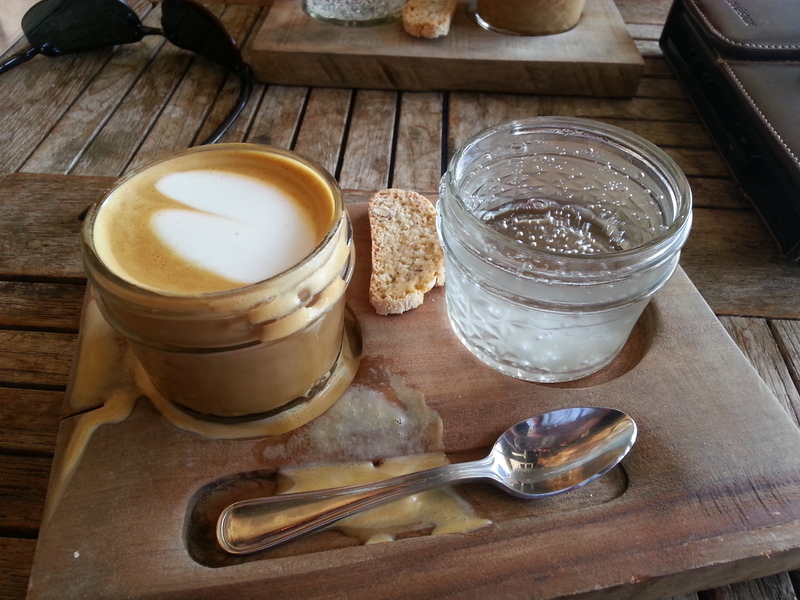 Their cortado is served with biscotti, a spritzer of mineral water, all on a cool rough board as a serving tray. It’s incredible and it is so smooth. Unfortunately, I jarred mine as I was walking to our table so the latte art (which was perfect) doesn’t look quite so perfect here. I have since read criticisms of the shop because they don’t have wifi but who doesn’t have 3G or 4G (or couldn’t just put their phone up for a bit and enjoy the shop, people and coffee)? This shop is a real winner in our book. They host cuppings every other Friday at noon and we vow to make one. 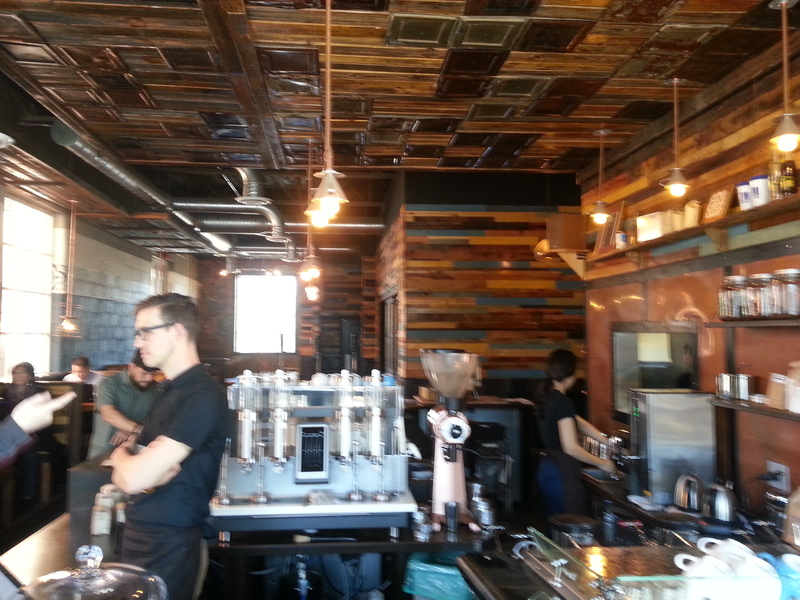 The coffee, the ambiance, a beautiful spring day … this was a great start for the DFW Coffee Hunters! We’re two coffee nerds who will go a long way for a great cup of coffee or awesome coffee beans. 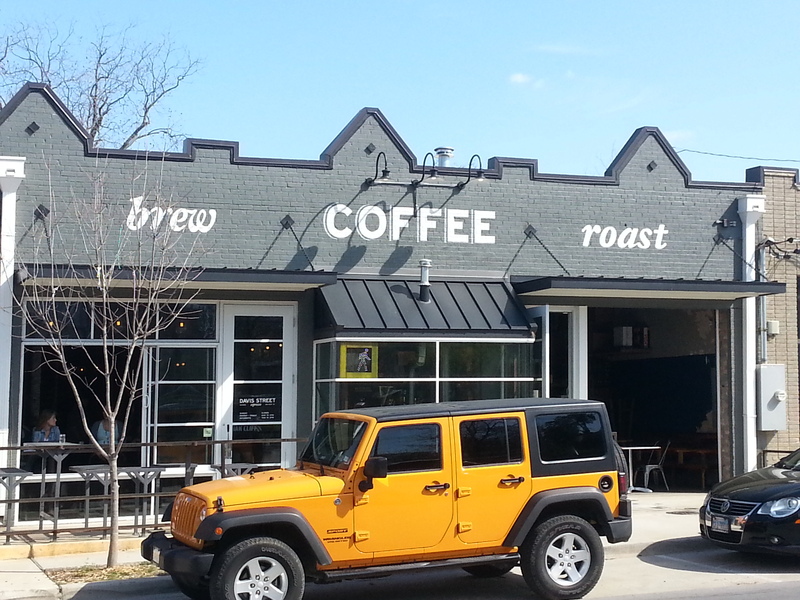 But things got seriously serious when the Eater Dallas blog ran a list of the top 14 coffee shops in the DFW Metroplex. We decided we needed to visit each one and see for ourselves. So we’re headed out to drink coffee, soak in coffee shop atmosphere, and let you know where we think you should be grabbing a latte, cortado, or just a cup of Joe!